Well, it is July and you are in for a great ride plus a couple of surprises with us! From Cheyenne we headed for Sheridan, WY a little whistle stop town offering some local history. Our next stop was White Sulphur Springs, which was smaller still and wasn't even on a RR route! This is where we chose to stay through July 4th. 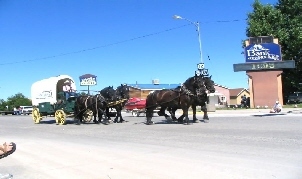 The RV Park was great, people extremely friendly and the local celebration was typical 'Western' with lots of fun! From here we also visited Helena, the Capital of Montana. East Glacier was our next stop so we could really take our time and tour Glacier National Park. We rode through it on our Gold Wing many years ago and knew we had to return! While here we had some surprise visitors! Missoula, MT was one of our shorter stays and the weather started heating up to a triple digit category. We did manage to get one interesting tour in at the 'Smoke Jumper's Training Camp'. This proved more than a little interesting! Deer Park, WA was an R&R stop, as it had a pool, spa, etc. We stopped briefly at a RV Dealer for a repair and our final stop before Seattle was Ellensburg, WA to visit the Columbia River and the Wanapum Dam. The picture above was taken during the 4th of July Parade in White Sulphur Springs, MT. By the morning of the 4th we were friends with several people at the Conestoga RV Park where we were staying. People were so friendly there! Many of us took our chairs and something to drink and found a spot along the Main St. in town to watch the parade. Half the town was in it and the other half was watching.. The Rodeo followed the parade which turned out to be a real treat. Again the whole town was there with family members in the arena or cheering from the bleachers. The people sitting around us explained what the different games were about. Later in the afternoon we attended a wonderful barbecue with many homemade goodies contributed by the locals. Needless to say after dark was a fire works display which we were able to watch from the campground near the park campfire. 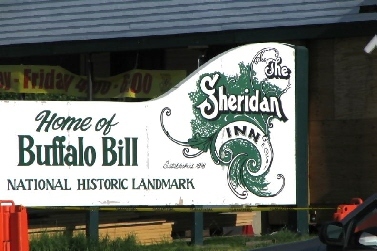 Sheidan, WY was a one night stay, but even here we found a historical hotel built by the RR, and a hang out of Buffalo Bill. They proudly displayed his signature on the hotel register. Old pictures hung on the walls telling the historical tale. An old 1940 coal fired locomotive sat outside on display for everyone to admire. This was an active train yard and we noticed the old Depot was for sale. Someone will enjoy that!